When you guide a load, you are at risk of electric shock. 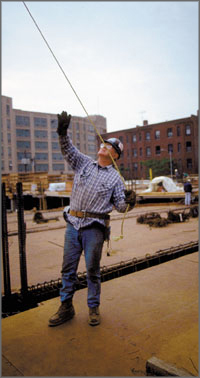 If the crane or other piece of equipment you are guiding hits an overhead power line, electricity can travel down the tag line that you are holding and through you. In the event of power line contact, workers on the ground are in the greatest danger of shock. Don’t try to guide a load and spot at the same time. Assign a spotter whose only job is to make sure the equipment stays clear of power lines. Spotting effectively needs someone’s full attention. When you guide a load, have a spotter who can alert you if equipment gets too close to power lines. Your life could depend on it.